Flooring Sample Package Option #16 includes Antique and Rustic brick tile samples in whitewash color mixes only. These are the standard sizes typically used on wall project installations. They can however be installed on flooring project installations as well since all of our brick tiles are made for flooring installations! . Total of 8 full brick tile pieces. 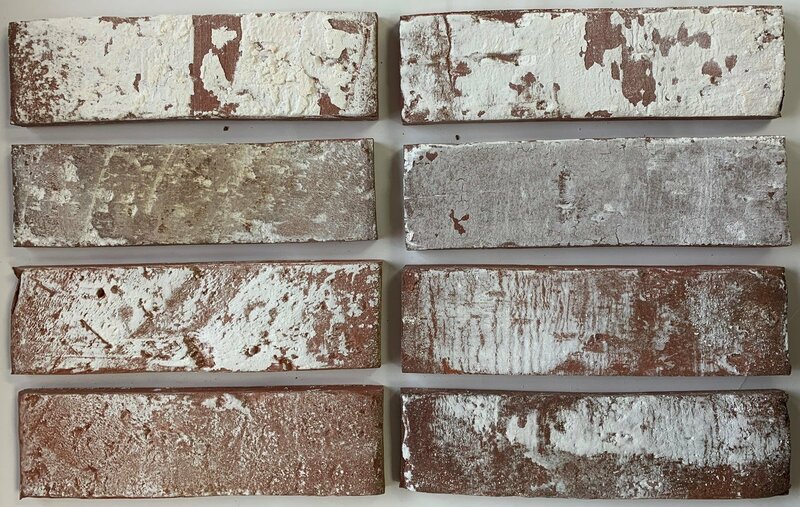 ** Total of eight full brick tile samples in two different sizes included in this package. ** Please Note - A Minimum of 50 sqft is required to place an order once you decide you love the samples you receive. Every brick we manufacture is made from scratch. In order to create tiles that have an aged, authentic appearance, we travel extensively to find antique bricks that we can use to cast new molds, some of which are well over 100 years old. Once we find a mold we want to re-create, we use 100% clay compressed to 1/2 inch thickness and then fire it in our kiln at 2200˚F. This means that every brick is made individually and is given extra detail and care. The natural look of our bricks is orange-red with brown undertones, owing its patina to the rich color of the clay we use. The texture of the brick mimics that of the sample from which the mold was made. We can even use different clay if you have a particular color preference. We can accommodate color requests, so be sure to ask us about clay variations for your custom brick veneers. Our thin brick tiles are handcrafted from 100% natural clay and wood ash materials. We imprint these materials in custom built thin molds formed from the faces of antique bricks. They are fired in gas kilns at 2200 degrees Fahrenheit (Cone 5) yielding a product 4x stronger than your average tile. This durability makes Real Thin Brick products an excellent option for indoor or outdoor flooring. 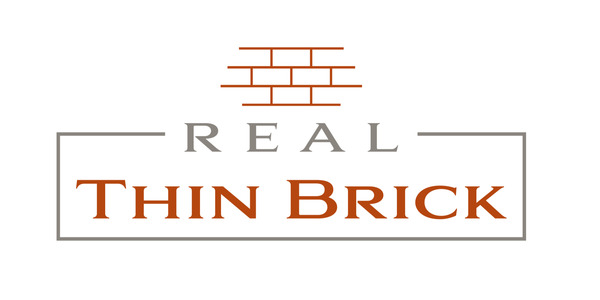 Each brick is approximately 1/2" thick, guaranteeing lightweight, easy installation on walls or floors without the requirement of structural reinforcements or sub floor leveling.The result is a high quality, accessible product that meets the individualized needs of our customers. Our business model promotes our customers as designers, giving them the option to choose the size, style, color variance, special effects and finishing touches of their bricks. No other brick manufacturing company offers this level of customer driven specification and participation. Return policy: 30 day money back guarantee! Love our brick tiles or send them back to us for a full refund or for a replacement! We also guarantee replacing broken brick tiles if any occurs during shipping. Our brick tiles are super strong and durable and travel well to anywhere in the US or World. In the rare occasion a shipment is mishandled during transit, we will send you a replacement order asap at no additional cost to you! You can reach us online through our contact form, or call or email us directly. You can also schedule an appointment to stop by to view our products in person. Our showroom is located 15 minutes south of Seattle at 881 industry drive, Tukwila, WA 98188.